Yovel is the Hebrew word for Jubilee. Jubilee was pronounced every seven years in Israel as a time when debts were forgiven and slaves were set free. 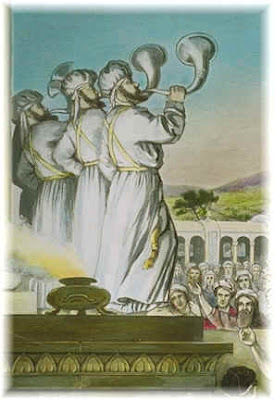 The name comes from the horn, or shofar, used to announce Jubilee. Every fifty years there was a super Jubilee. All land went back to the original owner to prevent one man from amassing all the wealth. I have been thinking quite a bit about Jubilee. I keep seeing the word everywhere I go and in everything I read. I would love to experience a year of biblical Jubilee. Can you imagine all of your friends' debts being forgiven? What a party! It really hit me as I thought about it. Jubilee wasn't designed by God to teach us how to receive, but how to forgive. It's a year of repentance and returning. It's a year that you get to forgive those who owe you spiritually, emotionally, financially, and so on. For you to declare Jubilee, you must be willing to forgive. You must be willing to repent. What a beautiful picture of God's love for us. In repentance I am choosing to declare Jubilee this year. Praise God for His forgiveness. "You shall hallow the fiftieth year, and proclaim liberty throughout the land to all its inhabitants; it shall be a jubilee for you, when each of you shall return to his property and each of you shall return to his family” (Lev. 25:10).